Everything must eventually come it its end and so it is with the series of books, The Ballad of Sir Benfro. 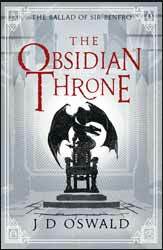 The Obsidian Throne (2016. 600 pages), written by J D Oswald, is a monster of a finish for the story of Benfro, the dragon and human, Errol, born on the same day whose fates are intertwined. The previous book in the series detailed how Errol met Benfro and in truth the first book did read a little like one boy and his dragon, the later books of this Welsh inspired world new levels of richness. If you have read the books so far this next bit will makes sense, if not what are you doing reading the end of a series before the beginning. We left Benfro and Errol, as well as the extended cast of both Dragons and humans, at a bit of an impasse. Both Gog and Magog, the dragon mages who ripped the world into two, are dead in a physical sense. The magic which held the two worlds apart are unravelling, once again humans and dragons have to confront one another. Meanwhile, Queen Beulah is at the gates of Candelhall meaning to raise it to the ground and slaughter all of its subjects for swearing fealty to Princess Iolwen. The book jumps between many points of view trying to cover a lot of ground without losing either pace or direction. Oswald likes to write long descriptive passages, which is fine if you are fully committed to the world he describes. I couldn’t say that this verbosity stands in the way of the story, but I personally would have liked to have seen a leaner, tighter book for the series last novel. So much of what is described is nice detail but completely superfluous as far as the plot is concerned. As this is literally the last book in the series it does come to a conclusion, although, without spoiling it, I think the choice will split his readership - although I thought that the author had come up with a fitting end.